Puranpoli, also known as Indian sweet flatbread from many regions of India as evident by the name as Vedmi, holige, puranachi poli, god poli etc. Maharashtrian style: Puran Poli “filling is made using chana dal or Bengal gram. In Gujarati style called Vedmi”. The filling is made with arhar or splits pigeon peas. Puran mean stuffing which prepares with lentil Bengal gram or pigeon peas, Poli means roti/outer covering made from whole wheat flour. First, wash & soak chana dal 15-20 minutes. Combine dal with 1 1/2cups water in a pressure cooker, mix well and give 4-5 pressure. Allow the steam to escape before opening the lid, drain it and coarsely grind it. Take a pan to add 1tbsp ghee, grind dal, jaggery sautes 1-2 minutes then jaggery melted cook, stirring continuously add saffron, cardamom powder, nutmeg powder and mix well and cook, stirring till it will be dry. When it should be like a soft dough, remove and cool.After cooling divided the stuffing into 14-16 equal portion and roll into balls. Take a big bowl, add whole wheat flour, a pinch of salt, pinch of turmeric powder,2tbsp ghee or oil mix it well, add water as per required to make it a soft dough. Keep aside for 30-40 minutes cover with a damp cloth. Divide dough into14-16 equal portion and roll into balls, flatten each ball in the palm, stuff with one roll of Puran, and cover it and seal the edges and make it roll again. Take a board to dust it with flour and make roll5-6inches diameter disk of medium thickness, heat a griddle or a tava and cook over a medium flame until it turns golden brown in color from both sides. 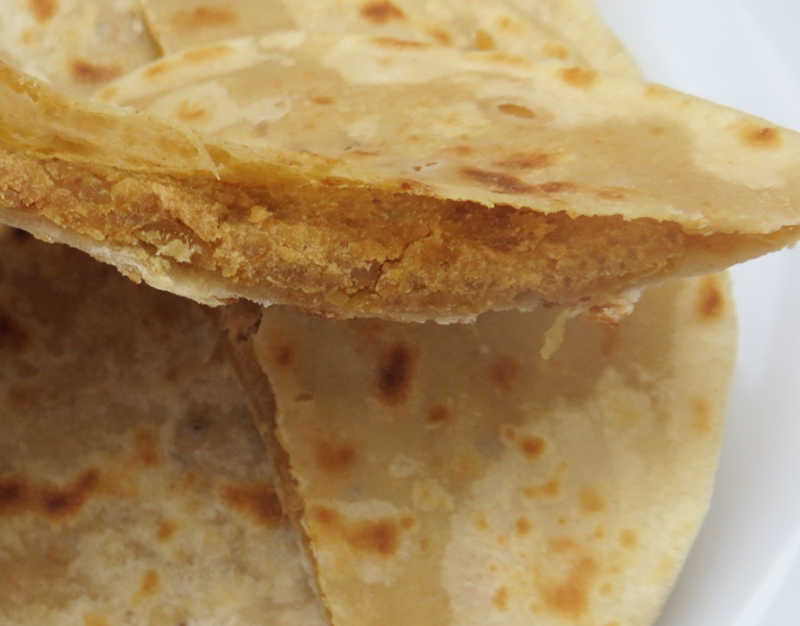 Puran Poli is ready, remaining dough and filling to make all other Puran Poli. Smear a little ghee on each Puran-Poli and serve hot with milk or Kesar- Ilachi Shrikhand, potato bhaji !!! !